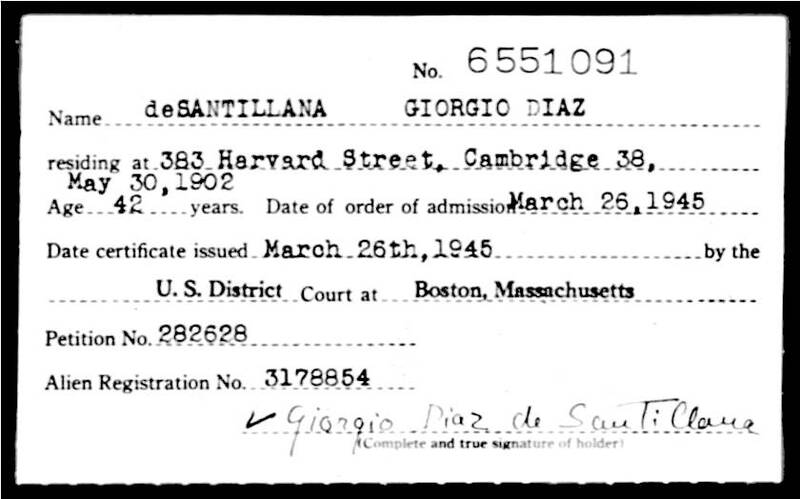 Giorgio Diaz de Santillana was born on 30 May 1902 in Rome, Italy; he died on 8 June 1974 in Dade County, Florida. 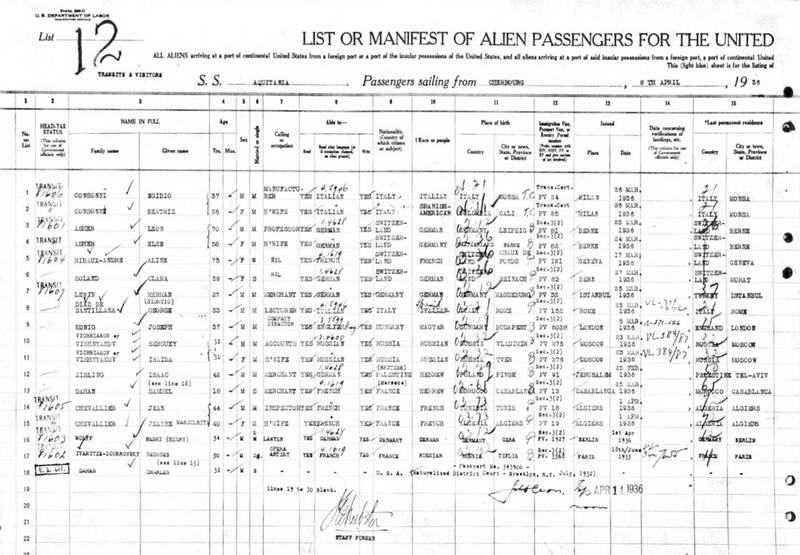 Giorgio came to the United States from Italy, arriving on the SS AQUITANIA on 14 April 1936 (see passenger manifest shown below). During much of World War II (1943-1945), he served in the United States Army as a war correspondent for the Stars and Stripes Newspaper. He became a naturalized citizen of the United States on 26 March 1945, presumably as a result of his military service (see certificate shown below). In September 1948, he married Dorothy Hancock Tilton (1904-1980). He and his wife lived most of their married life in a Boston suburb, the town of Beverly, Essex County, Massachusetts. His academic career at the Massachusetts Institute of Technology (MIT), commenced in 1941 when he joined the Faculty as an Instructor. In 1942, he became an Assistant Professor. After his tour of duty in the Army (1943-1945), he returned to MIT and was made an Associate Professor in 1948; in 1954, he was made a full Professor of the History of Science in the School of Humanities at MIT. He was a senior professor of Humanities at MIT, when I was an undergraduate there at the beginning of the 1960's. It was Professor de Santillana, an internationally recognized authority concerning the history of science, who introduced me to his profound epistemological ideas concerning the connection between astronomical science and the great mythological tales of ancient civilizations. In 1969, he and a younger colleague, Dr. Hertha von Dechend (1915-2001), published a book entitled: Hamlet's Mill, An Essay on Myth and the Frame of Time. Although it took a number of years to fully enter the consciousness of Academia, this book revolutionized our understanding of the connection between the mythological stories of Pharaonic Egypt, Babylon, Greece, Christianity, etc. and the ancient observations pertaining to the stars, planets and, most notably, the 26,000 year precession of the equinoxes. 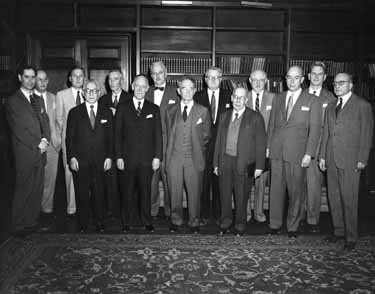 Group photograph made during the retirement ceremonies for Harvard University physics professors Percy Williams Bridgman and Philipp Frank. Photo was taken in the Harvard Faculty Club in May 1956. From Left to Right -- First row: Gerald Holton, I. I. Rabi, Detley Bronk, P. W. Bridgman, Philipp Frank, W. V. Quine, Giorgio de Santillana of MIT. Second row: Charles Morris, Nathan M. Pusey - President of Harvard University, J. Robert Oppenheimer, Dean John Burchard of the MIT School of Humanities, Perry Miller, Howard Mumford Jones, and Hartford Brown of Brown University. Giorgio Diaz de Santillana was born in Rome in 1902 and there received a degree in physics from the university in 1925. After two years of graduate work in philosophy in Paris and two years in the physics department of the University of Milan, he was called back to the University of Rome by Federigo Enriqucs, Professor of Higher Geometry, to help organize a school for the History of Science. As his assistant de Santillana taught history and philosophy of science and collaborated with him on a history of scientific thought with special attention to antiquity. Giorgio de Santillana made no bones about being a scientific rationalist, but what he said and how he said it had little in common with the sere and cramped academism of many of his contemporaries ... The conviction that the deepest commitments of science were the earliest led him, notably in The Origins of Scientific Thought (1961), to find all the fundamental strategies of Western thought about nature worked out in the Presocratics. He was confident that the timeless fellowship to which Pythagoras, Archimedes and Niels Bohr belonged could be traced farther back still. 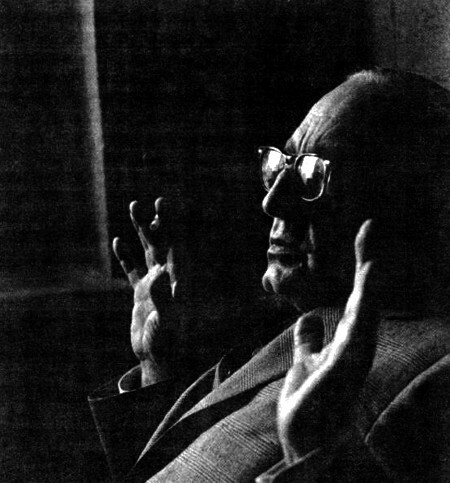 His last book, Hamlet's Mill (1969), the fruit of long collaboration with Hertha von Dechend of Frankfurt, was an end run around those scholarly custodians of the history of early astronomy who consider myths best ignored and those ethnologists who consider astronomy best ignored, to arouse public enthusiasm for exploration into the astronomical content of myth. But the book went to press when the last energies he could direct were exhausted, and the exploration will have to be continued by others. The Crime of Galileo (1955) earned him not only great public acclaim but considerable reprobation. As a man of conscience in Mussolini's Italy he had learned to recognize the control of thought in the name of security (as defined out of imperative needs for public docility and administrative convenience). He was documenting a familiar pattern in the events of 1616 and 1633, when sensible and experienced men agreed in the interest of a "higher freedom" that the option to choose between ideas should not be left to the individual. In the heyday of Senator Joseph McCarthy there were many eminent historians who, having chosen prudent silence, came to believe that Galileo might well have done the same; and there were zealous spokesmen for the Church for whom The Crime of Galileo was bad public relations, and who hoped to keep the reconstruction of those fateful episodes on a properly elevated philosophic and theological plane. It took nearly ten years for one of the most scholarly Jesuit historians to clear the air by remarking in a public forum that, given a nuisance like Galileo amidst the predicaments of the Counter-Reformation, had he been Pope he would have done exactly as Urban Viii did. Of the many prizes Giorgio received, none pleased him more than the national award given his short article "Galileo and Oppenheimer." It was published in The Reporter in 1957, at a time when nothing could have been further from the concerns of most historians of science than the scholarly study of current events. The article sketched a modern parallel to the determination of Urban "to break once and for all what to him was the incomprehensible arrogance of the scientific mind," and to the ultimate consequences of his pride, the further weakening of the institutions he was trying to defend. Through these writings and in fact through all of Giorgio's books and articles in English, French and Italian (the language was always chosen to seek out the readership capable of responding to the challenge) there runs that old instinct of the humanist that has hardly survived in this age of disciplinary specialization: "My feeling is that history deals with intensely live issues and should remain current, as the modern saying is ... There are too many important things to be dealt with to waste our time on erudite trifles." That was said by a man whose erudition was enormous, but who would apply it to no end less weighty than keeping the grand traditions of science alive, defending "the actual, original ever-living spirit of cosmology against the present vogue of positivism, operationalism, and their like." He saw a familiarity with the most adventurous, most engaged, and most original thinkers of the past as the indispensable guide to developing in their successors "the science of strategy and the art of making decisions." I knew Giorgio for only the last twenty-five years of his life. When I first wandered into his office I discovered to my delight that he was always ready for a serious conversation. He never descended from the highest level of discourse of which he was capable. I was one of a number of equally green undergraduates who studied, conversed, and attended his classes year after year, drawn on by that brilliance, eloquence, and charming vanity. We were determined to reach a depth of comprehension that would let us contribute as well as take. Not that we were ever treated as less than conversational equals, but we knew how much was going over our heads. One of our deepest satisfactions -- I speak for people who kept dropping in for decades -- was gradually to understand the coherence of perception and value behind Giorgio's ideas and intuitions and to realize that our pains had been well rewarded. None of us could be called disciples. Giorgio did not encourage that ambiguous filiality that discourages some students from disagreeing with their teachers and at the same time drives them to concoct devious strategies for defining their own intellectual identities. The five gentlemen whose photographs appear above were all good friends of Giorgio de Santillana and of each other. 1) Norbert Wiener was a child prodigy; in 1913, he acquired a Ph.d. from Harvard in mathematics at only 18 years of age. In 1919, he joined the faculty of MIT, becoming a full professor of mathematics in 1931. During World War II, his work on the automatic aiming and firing of anti-aircraft guns caused Wiener to study Communication Theory and eventually formulate his theory of Cybernetics in 1948. After the war, his fame enabled MIT to recruit a research team in Cognitive Science, composed of researchers in neuropsychology, mathematics and biophysics of the nervous system; these researchers included Warren McCulloch and Walter Pitts. All of these men later made pioneering contributions to Computer Science and Artificial Intelligence (AI). Wiener and Giorgio de Santillana were close friends at MIT during the 1940s and 1950s, until Norbert's retirement in 1960. They enjoyed discussing topics related to the philosophy of science and mathematics with each other. On a lighter note, Giorgio was an expert on Tarot card reading and Wiener loved to have his fortune told. 2) Jerome Lettvin was a cognitive scientist and Professor of Electrical and Bioengineering and Communications Physiology at the Massachusetts Institute of Technology (MIT). He is best known as the principal author of the 1959 paper: "What the frog's eye tells the frog's brain" - one of the most cited papers in the Science Citation Index. He wrote the paper with the assistance of Humberto Maturana, Warren McCulloch and Walter Pitts. A graduate of the University of Illinois Medical School, Lettvin practiced Psychiatry in Illinois and later in Boston. In 1951, at the urging of Norbert Wiener, both Lettvin and Warren McCulloch, joined the faculty at MIT. One of my best friends at MIT was Giorgio de Santillana, the historian of ideas. He was a most learned and kindly man with a mordant wit. Walter, Wiener, and I often hung out at his office. Giorgio was a past-master at fortune-telling with the Tarot. Wiener loved having his fortune told. Giorgio vainly tried to persuade him that the Tarot should be a rare and sometime thing to be used only in crisis, but Wiener would have none of such excuses. For example, Walter and I used it when we started a new experimental venture. There's nothing mystical about it - it brings up, by chance, associations that you do not ordinarily consider and in that way serves to break the constraints that hemmed your thinking. It is a charming way of introducing overlooked contingencies. So every month or so, Giorgio would give in to Wiener and come up with a fortune together with a complex character analysis. At the end of the reading, Wiener would exclaim "But that's not me, that's X (or Y or Z)" where X, Y, or Z were fellow mathematicians. Giorgio would shrug and say "You may have been thinking of them when you picked the card." -- The History of Neuroscience in Autobiography, Volume 2 (published 1998), Edited by Larry R. Squire, pages 234-235. Let me describe Maggie for you. She was one of the most beautiful women I ever met, in both appearance and character, utterly unpretentious and with great native intelligence. My family looked down on her, my friends did not. She had had only a high school education, and my mother stayed angry for years. One evening, shortly after we came to MIT, we visited Giorgio de Santillana, the historian of ideas and an old friend from my student days, at MIT. Giorgio was an adept at interpreting the Tarot. Scarcely a month would go by but Wiener would insist on having his Tarot told. 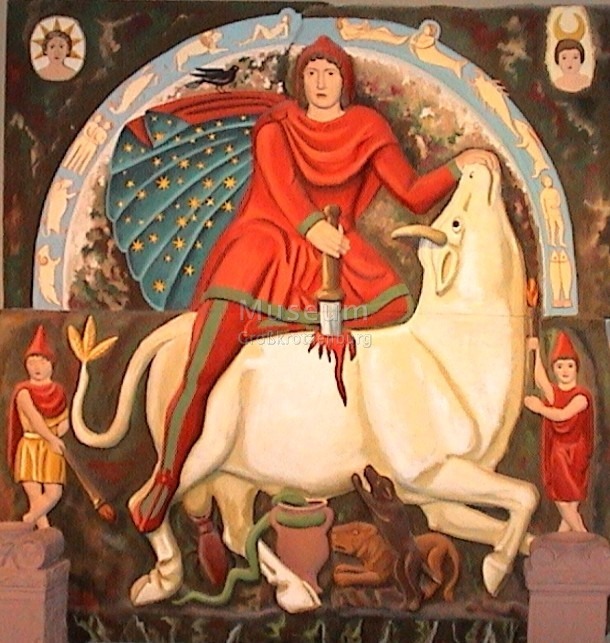 Giorgio vainly explained that the Tarot should be consulted only at times of important choice. Wiener claimed he always had such a crisis and needed counsel. At any rate Giorgio was charmed by Maggie and offered to read the Tarot for her. She was now about twenty-five. He read the cards with a faint air of disbelief. 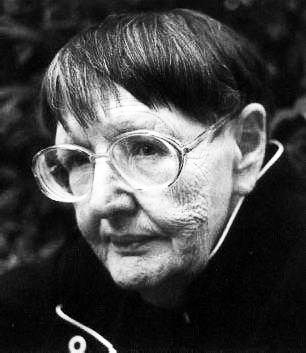 They told that by age forty she would become a figure of renown, an author and an innovator. Maggie still remembers that evening with some awe, for all came true. In her early thirties, after we had forged our three kids she was back-ended by a hit-and-run driver. For months she could scarcely lift here arms. Refusing surgery, she studied Gray's Anatomy and worked out what sort of mechanical regimen would restore her. Recovery was slow but steady, and within a year she was symptom-free. Others came to her for their mechanical disabilities and she worked out from here newly gained knowledge of anatomy and kinematics some remarkably successful conservative treatment. She charged nothing, was only interested in helping. Several students, after being helped, persuaded her to hold fitness classes at MIT. Within a year there were about two hundred people per day taking those classes. Then Channel 4 in Boston picked her up, then PBS. For the next seventeen years her program, Maggie and the Beautiful Machine (everybody's body), was a PBS standby and her MIT classes stayed crowded. She published four books in her forty's and gloried in the fact that medical practitioners approved of her approach. One book is still in print after twenty-five years. Now she is beginning a new career on the Web, giving counsel on how to relieve back pain without medicaments. The only pity is that Giorgio could not know that all this happened. He began failing before her ascent picked up steam. 3) Warren McCulloch was a Neurophysiologist and Cybernetician. His work helped to establish the Neural Network theory of the brain in a number of classic papers: including "A Logical Calculus of the Ideas Immanent in Nervous Activity" (1943) and "How We Know Universals: The Perception of Auditory and Visual Forms" (1947). 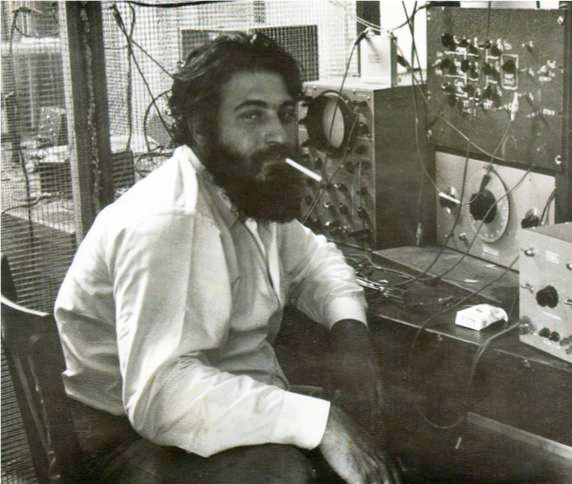 From 1952 he worked at the MIT Research Laboratory of Electronics, working primarily on neural network modeling. His team examined the visual system of the frog in consideration of McCulloch's 1947 paper, discovering that the eye provides the brain with information that is already, to a degree, organized and interpreted, instead of simply transmitting an image. The result of that research was summarized in the paper he authored with Jerome Lettvin, Humberto Maturana and Walter Pitts entitled: "What the frog's eye tells the frog's brain" (1959). 4) Philip Morrison was a theoretical physicist and astrophysicist. In 1940, he earned his Ph.D. in theoretical physics at the University of California, Berkeley, under the supervision of J. Robert Oppenheimer. In 1942 he joined the Manhattan Project as group leader and physicist at the laboratories of the University of Chicago and Los Alamos. In July 1945, he was an eyewitness to the Trinity Atomic Bomb test and helped to transport its plutonium core to the test site. 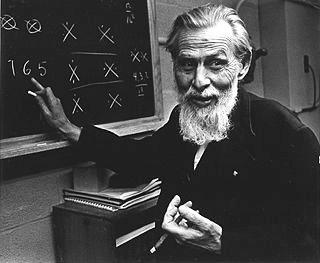 From 1946 until 1964, Morrison was on the faculty of Cornell University working primarily in the field of theoretical astrophysics. 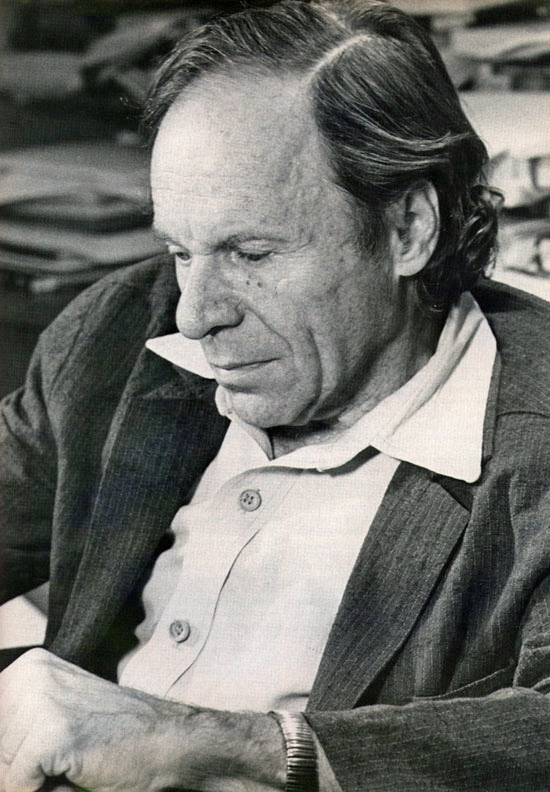 In 1964 he joined the MIT faculty as a professor of Physics, becoming an Institute Professor in 1973. The book is polemic, even cocky; it will make a tempest in the inkpots. It nonetheless has the ring of noble metal, although it is only a bent key to the first of many gates. 5) Walter Pitts was an autodidact who basically taught himself logic and mathematics; he was also able to read a fair number of languages, including Greek and Latin. 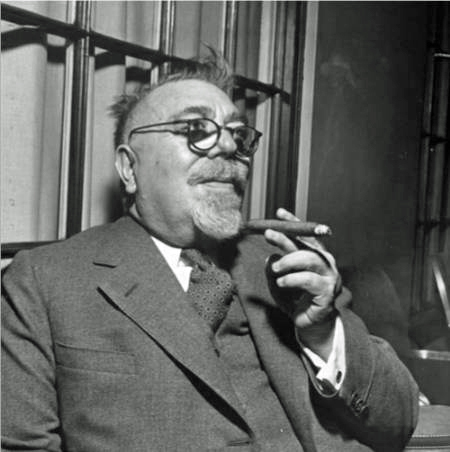 Like Norbert Wiener, he was a childhood prodigy and a genius of the highest order. At the age of 12, he spent three days in a library reading Principia Mathematica and sent a letter to Bertrand Russell at Cambridge University pointing out what he considered to be serious problems with the first volume. Russell was appreciative and invited him to study in England. Although this offer was not taken up, Pitts decided to become a logician. In 1938, Pitts ran away from home at the age of 15 to attend Russell's lectures at the University of Chicago. He stayed there attending lectures, without registering as a student. While at Chicago in 1938, he met Jerome Lettvin, who was actually a registered student there, and the two became good friends. Pitts also met the logician Rudolf Carnap at Chicago by walking into his office and presenting him with an annotated copy of Carnap's recent book on logic. Carnap was so impressed by Pitt's understanding of advanced logic that he arranged for Pitts to be given a menial job at the university. Pitts at that time was homeless and without income. Later Warren McCulloch arrived at the University of Chicago; in early 1942, he invited Pitts, who was still homeless, and Jerome Lettvin to live with his family. In the evenings McCulloch and Pitts discussed many topics of mutual interest. Pitts was familiar with the work of the 17th century philosopher Gottfried Leibniz on computing and they considered the question of whether the nervous system could be considered a kind of universal computing device as described by Leibniz. This led to their seminal paper: "A Logical Calculus of Ideas Immanent in Nervous Activity" (1943). This paper proposed the first mathematical model of a Neural Network. The unit of this model, a simple formalized neuron, is still the standard of reference in the field of neural networks. It is often called a McCulloch–Pitts Neuron. In 1943, Jerry Lettvin introduced Pitts to the mathematician Norbert Wiener, who was in need of an assistant. 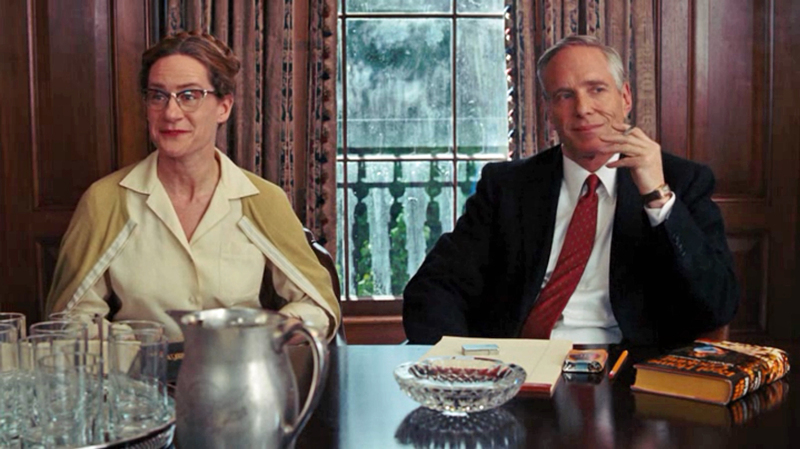 Their first meeting went so well that Pitts moved to Cambridge to work with Wiener at MIT. While at MIT, in 1951, Walter collaborated with Giorgio de Santillana in writing an article entitled: "Philolaus in Limbo: or, What happened to the Pythagoreans" for Isis, the academic journal for the history of science. Also in 1951, Norbert Wiener convinced MIT to establish a brain research group composed of mathematicians and physiologists of the nervous system. This group included Pitts, Lettvin and McCulloch. Pitts wrote a lengthy thesis on the properties of neural nets connected in three dimensions. Jerry Lettvin described Pitts as being "in no uncertain sense the genius of the group … when you asked him a question, you would get back a whole textbook." Although a genius, Pitts was also an eccentric and very private person. He refused all offers of advanced degrees or official positions at MIT because his name would then become known to the public. Pitts was devoted to the pure and total life of the mind, believing it to be superior to a life of more complicated relationships with people. During the 1960s, he became increasingly withdrawn and more exclusively attached to Warren McCulloch. Perhaps he sensed that, in some collaborations with other people, he was being used. Several of the scientists and psychiatrists of the brain research group thought that Pitts was schizophrenic and potentially very ill. The prominent psychiatrists who moved in his circles were more and more baffled by his reclusive shyness and his apparent personal discomfort. Later Pitts began to live on his own in Cambridge where he may have experimented with homemade drugs. No one seems to know much about his later life. He died in 1969 and there is speculation that he committed suicide. Actress Helen Coxe (shown above) plays Dorothy de Santillana in the 2009 film Julie & Julia. Professor de Santillana's wife, Dorothy, is at least as famous and perhaps more famous than her distinguished husband. Her full maiden name is Dorothy Hancock Tilton; she was the daughter of John Hancock Tilton and Elizabeth Worthington Seeley. The Tilton family of Massachusetts enjoys a very distinguished lineage; indeed, Dorothy is a direct descendent of John Hancock (1737-1793), first signer of the Declaration of Independence! I have added a separate page to this website devoted to the Tilton Family Genealogy. Dorothy was born on 23 August 1904 in Essex County, Massachusetts; she died on 19 June 1980 in Beverly, Massachusetts. Her father, John Hancock Tilton (born on 16 September 1870), was a successful real estate and insurance broker; Dorothy grew up in a comfortable upper middle class environment in Haverhill City, a northern suburb of Boston. Dorothy was a graduate of Radcliffe College (the women's liberal arts college affiliated with Harvard University), where she met and married the noted poet Robert Hillyer (1895-1961) in 1926. In the 1930 Federal Census, Dorothy, Robert and their two-year-old son Stanley (1927-1969), are listed in the enumeration for Windham County, Connecticut; both were identified as being teachers. 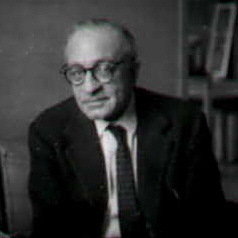 In 1934, Hillyer received the Pulitzer Prize for Poetry for his book entitled Collected Verse. Dorothy and Robert divorced in 1943. In 1948, Dorothy married Giorgio de Santillana. 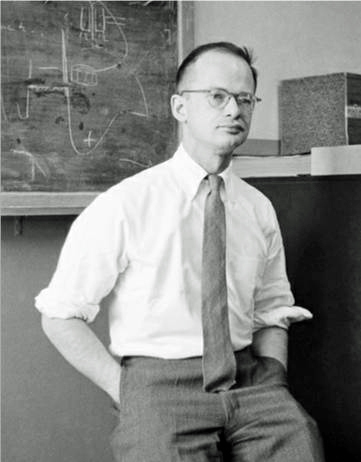 Dorothy's son, Stanley Hancock Hillyer, was born on 20 May 1927; he graduated from MIT in 1950. Stanley Hillyer, an executive with the Raytheon Corporation in Waltham, Massachusetts, died in August 1969 at the age of only 42. Dorothy de Santillana was a senior editor at the Boston publishing firm of Houghton Mifflin for many years. She had many notable clients including Julia Child and Garry Wills, among others. Strangely enough, her relationship with cookbook author, Julia Child (1912-2004), was of sufficient interest that Dorothy de Santillana is included as a character in the film about Child's early life entitled: Julie and Julia (2009). Her character is played by actress Helen Coxe (see the above photograph); in the film, Meryl Streep plays Julia Child. I ... got a call from Dorothy de Santillana, an editor at Houghton Mifflin publishing house in Boston. She ... told me "You have to write a book about Nixon." I replied that I had now said everything I knew about him - and besides, I did not think he could win in November. (So much for my political prescience.) She maintained that what I wrote about America - its conflicted Cold War liberalism - was what she wanted to hear more of, whether Nixon won or lost. After taking on the book assignment, I boarded Nixon's campaign plane (a far bigger deal than the one he was flying in January, when I had first joined him). ... Dorothy de Santillana read each draft of the book and found me some extra advances as it grew in bulk. She went to bat for me with other editors when they tried to kill my title, Nixon Agonistes - they said no one could pronounce the second word, people would be intimidated by it, afraid to ask for it in book stores. She pointed out that two of the most famous poems in the English language were Milton's Samson Agonistes and Eliot's Sweeney Agonistes. When the book came out, she arranged for a launch party at Sardi's in New York, and the senior publishing board came down from Boston for it. -- Garry Wills, Outside Looking In: Adventures of an Observer (published 2010). The following is a partial list of Professor de Santillana's literary works available in English; other than Hamlet's Mill, most are now out of print. The complete text of Hamlet's Mill is currently (April 2011) available online at the Phoenix and Turtle web site.